England director of cricket Andrew Strauss says "more separation" of the Test and one-day teams will improve their chances of winning the World Cup. England, who have never won the competition, were knocked out at the group stage this year. "We were a long way off the pace. Unless we focus on it, we will sleep walk our way into the next one," Strauss told BBC Test Match Special. "If we have a core of specialists we can prioritise both teams." Test skipper Alastair Cook was removed as one-day captain and replaced by Eoin Morgan less than two months before the World Cup started in February. England won only two of their six group games, against minnows Scotland and Afghanistan. 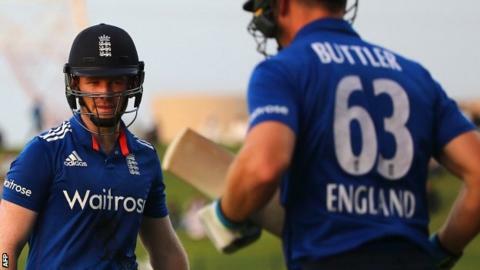 Former England captain Strauss said: "Our country is generally is quite red-ball focussed, but that doesn't mean it has to be at the expense of white-ball cricket. "That's one of my focuses - to re-balance it and give more importance to it." Only four England players involved in the current one-day series against Pakistan featured in the recent 2-0 Test series defeat. Strauss said one-day specialists would have "opportunities" to compete in the lucrative Indian Premier League (IPL), which clashes with the start of the English season in April and May. Asked about the IPL and the Big Bash, Australia's Twenty20 tournament, Strauss said: "I'm a massive fan. "If you are an overseas player, what those Twenty20 competitions do is put you under real pressure. "You have to stand up and deliver and that's a really good experience." How can England recover from World Cup exit? Read more on How can England recover from World Cup exit?